Is it possible to make a gun that could fire a projectile into space? The shell accelerates along the barrel of a gun because the hot gases push on it. Once it's moving at roughly the speed of sound, it's moving as fast as the gas molecules. So they can't catch up with it to push on it. That's less than the escape velocity from the earth (11km/s) so basically, the answer is not at the moment and possibly never. However, you don't have to reach escape velocity to enter Low Earth Orbit (LEO), which requires about 7.8 km/s (I think). Wikipedia lists a Delta-V of 9.4 km/s with wind resistance (for a rocket) adding 1 to 2 km/s more. So, BC's gun is actually pretty close to what is necessary to achieve LEO. One might be able to improve velocities with a magnetic accelerator. However, you also have to take into account wind resistance which would be considerable on Earth, especially for an object that would have to reach the full escape velocity near the launch point. And, thus, it would be far more practical to do on the moon, mars, or other bodies with a thin atmosphere. The speed of sound problem can be overcome by a two stage acceleration process the first stage accelerating a gun barrel cotaining the missile which upon obtaining the limiting velocity the ignites its propellent further accelerating the missile. There are of course better ways of getting missiles up to escape velocity but all use two or three stage systems. It is possible to get the velocity with a rail gun, where the projectile is powered by electric and magnetic reaction. Major limiting factor for launching to LEO is the required mountain to build the straight vacuum chamber needed to get the power requirement down. You just need muzzle velocity to be greater than 10km/s then it will be in orbit pretty soon. The need for a mountain is mostly for noise abatement, the sonic boom will be pretty big. It will really only be usable to launch mass, any person launching with it will be a puddle on the floor. If the problem is the speed of propagation of the explosion, then could you gain velocity by making a multi-point ignition, or perhaps a continuous area ignition? I.E. essentially making a multi-stage accelerator with a single stage. It's not an issue with the speed of propagation. It's the speed of the molecules. No kidding, the fireball as the projectile leaves the muzzle and hits the air would put a lot of burden on a heat shield. Maybe a rather long, skinny projectile would be work. Ablate the front end and still have some projectile mass left when it leaves the atmosphere. Or maybe you could use multiple projectiles, one to push the air out of the way as it vaporizes and the payload rides in it's wake. It is in Donald Duck cartoons, i had that episode in the early 70's. BC explained that there is a limit to the speed that molecules in the propellant are moving (speed of sound). A longer barrel will not help if you are using hot gases to propel. If as Sean suggested you are trying the railgun route - wikipedia has pages on both railguns and massdrivers - but they aren't ready yet. To get stuff into space it is envisaged that over a kilometre of track is required with superconductors and other rare materials. BC explained that there is a limit to the speed that molecules in the propellant are moving (speed of sound). There is a trick that Bull worked out; if you apply the hot gas sideways at carefully timed moments you can go above that. You need a wedge shaped sabot behind the projectile though and apply the force at an angle. The other way to go is to use multiple stages, like a light gas gun; if the gas is already moving at high speeds being pushed by a piston when you light it, then it's going to go supersonic (higher than the sonic speed of the hot gas). True, it could work, (a bit like how the soap flies across the bathroom when you try to get hold of it), but you are reaching into areas where rocket science is doing it the easy way. As space is regarded by most scientists to be the region of the atmosphere were aerodynamic flight is not possible 100 km is that designated altitude by the Fédération Aéronautique Internationale. In America the designated altitude for some unknown reason is said to be 80km probably to award themselves astronaut wings during the early 60's when they could barley get a rocket of the ground. The HARP project has launched 420-mm projectiles 143 km over Barbados so it is safe to say that gun launched projectiles have already entered space. Alan Shepards first manned flight into space was only 44 km higher. Lets do a bit of balistics. So they shot a massive projectile at about Mach 5 (more really- I ignored air resistance which is "significant" for hypersonic projectiles). Anyway, to get into orbit is just about possible. Out of the earth's gravitational pull, (11 km/s) isn't. HARP used a non-rocket spacelaunch method based on a very large gun to fire the models to high altitudes and speeds. The project was based on a flight range of the Seawell Airport in Barbados, from which shells were fired eastward toward the Atlantic Ocean. Using an old U.S. Navy 16 inch (406 mm) 50 caliber gun (20 m), later extended to 100 caliber (40 m), the team was able to fire a 180 kilogram slug at 3,600 metres per second (12,000 ft/s), reaching an altitude of 180 kilometers (591,000 ft). 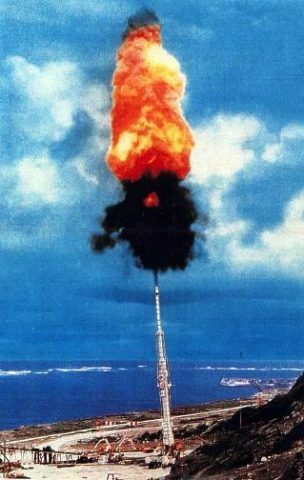 In 1966, the HARP gun fired a projectile to 112 miles high, a world record that still stands. As far as I am aware a gun can achieve it's greatest velocity when fired at an angle of 45°. If this is the case what speed and distance would the projectile [that reached an altitude of 112 miles fired at near 90°] have attained had it been fired at 45°? Page created in 0.211 seconds with 86 queries.